It's summer! Well, there is no summer here but let's pretend that there is and all we want to do is relax by the beach with our perfectly manicured hands curled around a glass of mocktail. What better color to paint your nails than a lovely shade of papaya?! I am obsessed with my papaya nail polish from The Face Shop. I used 2 coats here. The formula is alright, like all other The Face Shop polishes that I own. The color complements my skin which makes it even better. I liked it just by itself but I decided to have a little fun with it and did a cute leopard print. Leopard prints are so versatile ! I love how easy they are to do as well. Just use any kind of dotting tool, splotch on the color, go around it with black polish and you're done. 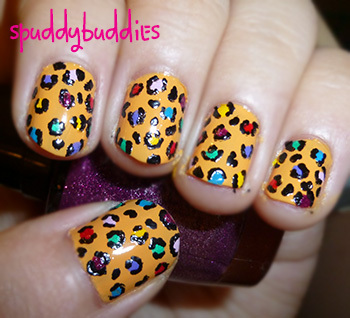 What do you think of this papaya leopard print? Love it or meh? I LOVE that shade of papaya! 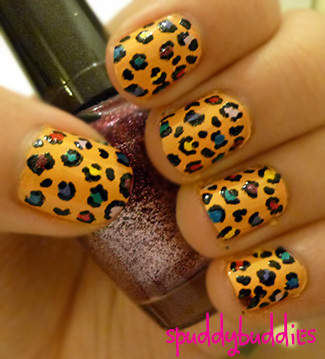 I am not a huge leopard print fan, but I do like this. I think I am going to have to go pick up that polish! I love that design :) It's a little bit funky and definitely would get noticed! Thanks so much for linking up to All My Bloggy Friends - I'm sharing this on FB too! Have a great weekend!